This species is currently only known from Hoang Lien National Park (Nguyen et al. 2013, Rowley et al. 2013). Strategies for additional protection of habitat within its range may be warranted as habitat degradation caused by tourism continues to be a threat. Further research into the species' ecology, distribution, relative population abundance, and past and current population trends would improve conservation decisions. 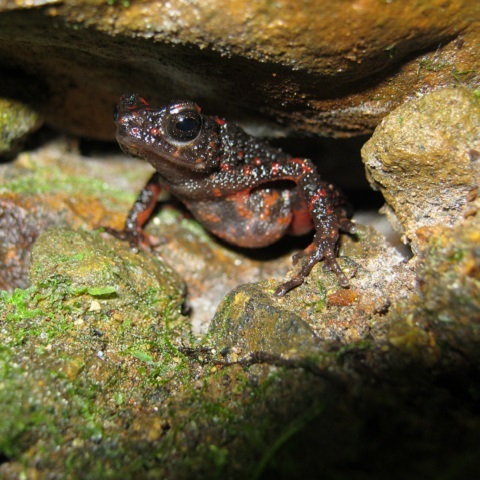 This species is known only from a single stream at 2,900 m asl on Mount Fansipan, Hoang Lien National Park, Lao Cai Province, Viet Nam (Nguyen et al. 2013, Rowley et al. 2013). Rowley et al. (2013) estimated that its range may include some of the few small, isolated areas above 2,700 m asl in other parts of the Hoang Lien Son Mountain Range. However, any such area is about 20 km or more away and separated by elevations under 1,000 asl, making the species' dispersal to these parts unlikely. However, it is likely to occur in the very small section of contiguous habitat extending 3 km west of the species' type locality into extreme-eastern Lai Chau Province. The species is very geographically restricted as its extent of occurrence (EOO) is 8 km2, which represents only one threat-defined location. Mount Fansipan has been surveyed relatively extensively compared to the majority of the region (e.g. Ohler et al. 2000, Nguyen et al. 2009, Rowley et al. 2013), however few surveys have detected this species and very little is known about the size and trends of its population except that it has been recorded as locally abundant (J. Rowley pers. comm. 2015). The population is very likely to be in decline due to past and present habitat loss and disturbance. The most immediate threat to this species' persistence is habitat degradation associated with tourism. Considerable pollution by garbage and runoff from toilets is recorded very close to the streams used by the species (Rowley et al. 2013) and the construction of a cable car from Sa Pa to the summit of Mount Fansipan is likely to affect it (T. Nguyen pers. comm. 2015). The historic burning and subsequent ecosystem conversion of the summit of Mount Fansipan and adjacent areas, which are thought to have been previously covered in forest (Nguyen and Harder 1996), is also likely to have disturbed this species. The species' restriction to high altitudes near the mountain peaks is likely to present an issue as tropical montane forests are expected to be particularly prone to alteration by climate change (Rowley et al. 2013, Foster 2001).